The most effective way of reaching and educating communities in good healthcare practices is through their own people. Trained and qualified Community Health Promoters work to ensure that their local areas are taught about the transmission and spread of diseases, along with the importance of personal hygiene and the dangers of unapproved cultural remedies. This essential work increases access to health care and facilitates early disease prevention and referrals to hospital. The Government accredited promotors also help to establish health reporting systems between local communities and the Mbale District Health Office. These individuals effectively take complex healthcare knowledge and make it simple and applicable to everyday life. In partnership with Mbale Regional Referral Hospital, JENGA meets with the neediest patients in the most vulnerable of situations to demonstrate the love of God through practical means. Hands of Love embodies JENGA’s desire to be “love in action”. When admitted to or abandoned at the local hospital, patients without access to finances or support can easily find themselves unable to meet even the most basic of needs – often lacking food, a caregiver, and even the ability to secure their prescribed treatment. JENGA employed hospital staff identify the poorest and most at risk patients. Hands of Love delivers both medical care and genuine connection to the emotionally and physically hurting. Whether expressed through a blanket, a prayer, a bath or an expensive surgery, JENGA is committed to reaching the people of Mbale. Alongside the hospital’s Nutrition Ward, JENGA is working to improve the immediate health and long-term well-being of malnourished children and their guardians. JENGA provides high sustenance meals on a daily basis. Over the course of the last few years the Hospital Feeding Programme has expanded beyond the Children’s Nutrition Ward to include specific patients and caregivers on the Tuberculosis Ward, the Neonatal Ward, the Psychiatric Ward, and many others on an “as-needed” basis. JENGA employs a full-time staff member to ensure that the correct meals are being prepared and delivered to the neediest and most vulnerable patients throughout the hospital. 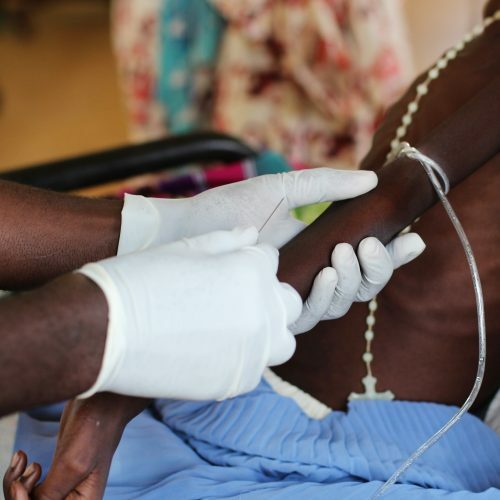 The Mbale Regional Referral Hospital is the only local resource for treating sufferers of childhood malnutrition. Alongside regular meals provided through the Hospital Feeding Programme, JENGA also partners with the hospital’s Children’s Nutrition Ward in a number of practical ways. Most of the families seeking treatment for their children have travelled for many hours, often by foot. Due to a lack of hospital resources, people are required to bring their own life-sustaining items such as food and bedding, but are often completely unequipped for the duration of their stay. After numerous hospital deaths due to preventable conditions such as hypothermia and malaria, JENGA began providing every day necessities such as clothing, bedding, blankets, and mosquito nets. Alongside this, JENGA supplements the relational capacity of the hospital staff by sending volunteers to play with the young patients, encourage their guardians and to pray for healing. This weekly interaction aims to combat the high number of overwhelmed mothers returning home before their children’s course of treatment has been completed. In a nation where medical services are massively under resourced, it is no surprise to find that psychiatric needs are overlooked and often misunderstood. JENGA funds the only full time psychologist in Eastern Uganda. Working from the main psychiatric unit, this individual, alongside two other part time counsellors, provides the imperative support to a people group who are marginalised and rejected in larger society. Through relational and professional interdependence and understanding, the members of Mbale’s mental health team have begun exploring the concepts and practical application of one-on-one and familial counselling, group training, and professional mentoring in a way rarely before used in Mbale. From this process, a ground-breaking drug and alcohol rehabilitation programme with life-changing possibilities has been birthed and begun to take root among prior patients and their friends. Illicit drug and alcohol use is a devastating problem in Uganda. Home-brewed alcohol and ‘street drugs’ are readily available and inexpensive, and many of the poorest individuals suffer from addiction. Uganda is one of the world’s highest per capita alcohol consumers in the world, with approximately 80% of the alcohol being unregulated home-brew. Substance addiction is also an increasingly significant problem. Many substance users develop psychological disorders, and the Mental Health Ward at the main government hospital is the only option for treatment of addiction or psychiatric care. Before JENGA’s involvement, there was limited provision for counselling or prayer intervention for these conditions with a heavy reliance upon medicinal treatment. Ongoing support was also not provided. JENGA now runs a Drug and Alcohol Recovery programme, leading support groups throughout the city of Mbale. Strategic locations beginning with the regional hospital were highlighted, and trained members alongside “lay counsellors” provide prayer and emotional support to many who enter the programme. In an area that had incredibly limited access to any kind of psychiatric care, big steps are being taken to reach these most needy of people. In partnership with Dentaid UK, JENGA is reaching communities through essential dental clinics. Most residents of these communities have never had access to any sort of prior dental care. JENGA coordinates with local partners to host visiting dentists who offer the necessary services cost free.